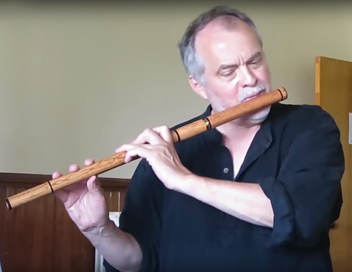 What is outstanding about the Windward C flute is the rich bell note, solid lower register and sonority of tone throughout the available three octaves. We copied the bore design of a fine old Dutch baroque instrument, modifying it slightly to increase the volume in the right hand. By repositioning and opening the tone-holes and by cutting a more aggressive embouchure we were able to bring the tuning up to date and increase the overall volume of the flute. Our C flute bore is responsive with any embouchure cut, and the flute’s appearance displays the standard Windward simple and streamlined exterior. It can currently be ordered without keys, or with one foot-joint key.